Online registration ends on July 13th at 11:59 pm. All Race Kits (bib number, T-shirt, chip and race information) MUST be picked up during one of the above two listed time periods at the listed location. There will be no Race Kit pickup and no registration on Race Day. Picture ID is required for Race Kit pickup. You submit a fully completed Official Tely 10 Authorization Form. You sign for another participant's Race Kit. Race fee is $70.00 ($65.00 NLAA members). Please visit race website for more information. Each participant who registers before June 30th, 11:59 pm, can select T-shirt size. Please refer to www.nlaa.ca/tely10/ for shirt sizing chart. NLAA member receives a $5.00 discount. 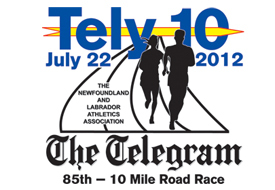 For more information on this event, visit the NLAA Tely 10 website.